Christmas Cities Network aims to promote the cultural European diversity values and especially the different and varied Christmas traditions in Europe, which are transcended to the whole world. 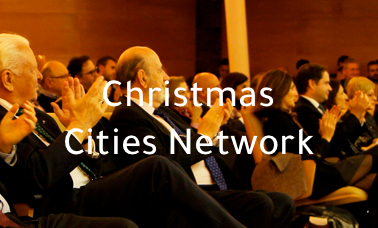 The registration on the Call includes annual membership to the European Cities of Christmas Network. A space for cities to exchange experiences, develop partnership and access to advice from the organizing team of the Call in matters of their interest. Associations, companies, foundations and people who want to collaborate with the objectives and exchanges of the Network may participate in the European Christmas Cities Network. The creation and promotion of this Project will repercute in the various sectors, such as economic, cultural or social that will be activated, impacting in a positive way in the life of communities and inhabitants of the cities. 1. Celebration of the Christmas Network Annual congress. 2. Organization of events and fairs during the year involving merchants and traders associations, artist and creators who want to associate his activity with Christmas and European Union. 3. Interaction between the partners in social, cultural and touristic levels. 5. Company exchange in national and international areas. – Register office, postal code (including locality, province and country), telephone number and email address. – Proof of payment of the register rights in the current account of the Christmas Cities Network Association, a nonprofit entity. The cities participaiting in the annual European Christmas Capital and City Call, will be exempted of the registration payment in the Christmas European City during a year.